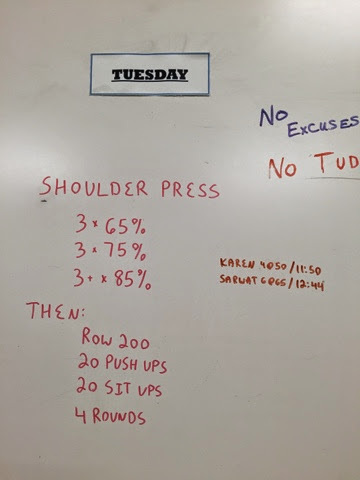 Run Bike & Forging Fitness: Bike and WOD -presses! I didn't too much over the weekend but I did get in a nice bike ride at the RTP trails. 8 miles in cold weather turned out to be much more fun than I expected and no excuses for me when it's 35 degrees outside! On Monday I skipped the gym so I could go to the chiropractor and he did a great job of adjusting my sacroiliac joint but then I got stressed out at work on Wednesday and locked up my back again! I skipped working out at the gym today but did all my ab work (planks, side planks, side bends, crunches, bicycles, leg raises). I definitely feel lazier as it gets colder!